The KLCDA managed to stop encroachments during its time despite being severely shortstaffed. The state government’s repeal of the Karnataka Lake Conservation Development Authority, the small but significant body in the protection of Bengaluru’s ailing water bodies, is a dire blow at a time of crisis. The state government’s repeal of the Karnataka Lake Conservation Development Authority, the small but significant body in the protection of Bengaluru’s ailing water bodies, is a dire blow at a time of crisis. A severe water shortage is on the horizon and our city’s lakes need to serve a number of functions from recharging ground water to maintaining the delicate balance of the ecosystem. The KLCDA managed to stop encroachments during its time despite being severely shortstaffed. With the maintenance of lakes shifted to the non-disruptive Minor Irrigation Department, which has let many an encroachment and destruction of tank bunds take place without objection, it seems as though authorities are far more concerned about protecting vested interests than the welfare of the city and its people. The cries of celebration for the scrapping of the proposed amendments to the Karnataka Tree Preservation Act (1975) have scarcely died down, but are authorities are not discouraged. Eco-activists have not been consulted in one more crucial step in this path of destruction, with the government repealing the Karnataka Lake Conservation and Development Act. The lake protection body had been brought into existence in 2016. In its amendment, the government stated that lakes under the jurisdiction of the BBMP will be transferred to the Minor Irrigation department. It goes on to state that the KLCDA will be merged with the Tank Conservation and Development Authority. Since its inception in March 2016, the KCLDA didn't receive a single boost either in terms of member strength or powers. Authorities scraped through the developmental works entrusted to them with a mere 14 staff members, when the actual requirement exceeded 100. Activists demand that the amendment be challenged but senior officials of the KLCDA say there is no scope to file objections since the act has already been passed in the house. "The activists, if they wish, can meet the governor or the Chief Minister," the official said. There is also no clarity on whether the developmental works taken up by BBMP and KLCDA will have to be stopped with the introduction of the recent amendment. "As of now, we have no idea whether we have to stop the rejuvenation works," said B.V. Satish, Chief Engineer, BBMP lakes. The KLCDA echoed the thought. "There is no clarity since the government has not passed any order in this regard. We have, however, carried out developmental works at Madiwala and Agara lakes. Apart from this, a lot of time has been spent on research work related to wetlands," said the senior official. Activists have raised the alarm over the repeal of the KLCDA, which was passed with less than 20 members in the assembly and no public consultation. The surreptitious transfer of lakes to the Minor Irrigation Department, which has been entrusted with responsibilities it is not capable of handling, has undoubtedly heckled researchers and conservationists alike. "The irrigation department has only managed irrigation tanks and its track record in that is not very successful either. How then is this department qualified to manage urban lakes for the multiple objectives of biodiversity conservation, lung space, groundwater recharging and possibly the storage of treated water?" asks Dr Sharachchandra Lele, a senior fellow at ATREE. Environment activists have upped the ante against the repeal of KLCDA, which, to its credit, has stopped several attempts to encroach lakes and even obstructed the construction of roads on tank bunds. It is believed that the authority, which was on its way to empowerment, has been killed by the government. Praising the efforts of KLCDA CEO Seema Garg, water expert Kshitij Urs said, "The roots of the authority have been cut without public consultation and debate. According to the constitution, national resources have to benefit everyone. KLCDA was an independent authority with no vested interests." At Doddabommasandra, the BBMP stopped the construction of the road project after the KLCDA intervened and with only 14 members, a bio-diversity park was established at Madiwala lake while Agara lake was rejuvenated. 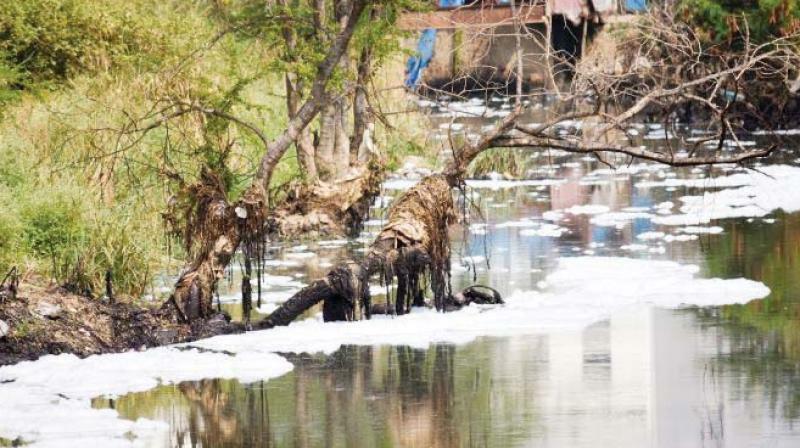 Urs alleged that the Yellamapachetty lake with an area of 400 acres on Kolar road had been encroached and as its custodian, the Minor Irrigation department did nothing to stop the entry of sewage entering the lake. Kunthur lake in Chamrajnagara district is another example of the inept handling by the Minor Irrigation department. "National Highways department was given a project to construct a road that ran through Kunthur lake. The irrigation department did nothing to stop it. The project was stalled after we intervened," Urs explained. One of the major objections to the amendment is that it rules out the possibility of citizen participation despite the fact that the minor irrigation department has no experience in handling urban lakes. The activists question the possibility of rejuvenating lakes by the department, which receives an annual allocation of Rs 120 crore. "The act has been killed on purpose and it will greatly affect the democratic idea of local self-government. The punitive laws of the KLCDA have affected vested interests, which is why it was repealed. How can an authority function without manpower or funds," demands Ram Prasad, co-founder, Friends of Lakes.